We’ve released a new update for Action Pad for BlackBerry® 10 Smartphones! We’ve added Category Management, allowing you to create, edit and delete categories and manage your categories with custom colors! We also added several more shortcuts, making Action Pad even easier to use for BlackBerry® Q10 and Q5 owners. Last but not least we fixed minor bugs, improving the functionality of the application. Action Pad is the perfect application for anyone who wants to manage their memos in an easier and more convenient way. Easily create, edit and delete memos and synchronize them with Microsoft Exchange and Evernote from within Action Pad. NEW: Category Management (create, edit, delete and organize). NEW: Shortcuts to improve workflow. 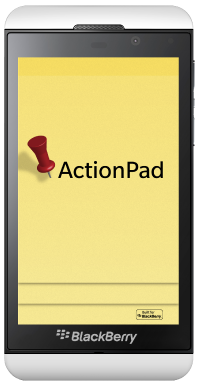 Action Pad is compatible with all BlackBerry® 10 Smartphones as well as BlackBerry Legacy OS devices. Previous Previous post: Merry Christmas & an ‘Appy’ New Year!